Coming April 30, 2019. You’re invited to stay at the Mona Lisa’s home! What?! The folks at Airbnb are at it again with a très unique contest. This time, it’s two round trip tickets to Paris for a stay at the Musée du Louvre, the world’s largest and most visited art museum. Start with a private, guided tour of the museum after hours, then relax in a lounge set up in front of the Mona Lisa. Next, sit down with the Venus de Milo for a gourmet meal prepared by your private chef, followed by an intimate acoustic concert in Napoleon III’s opulent apartments. 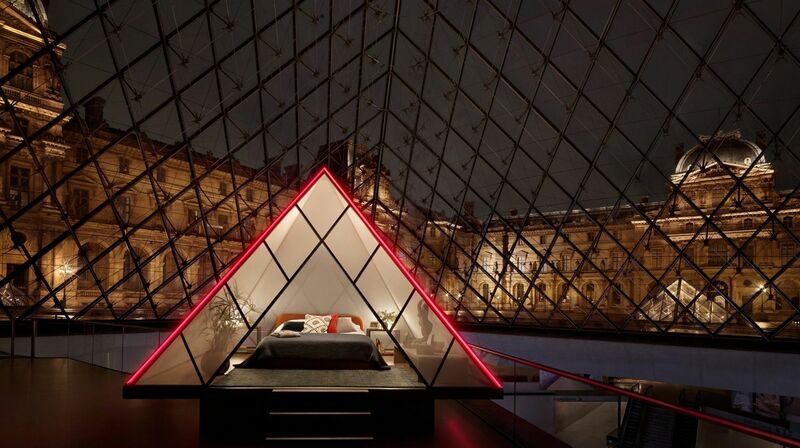 Finally, retire to blissful, art-filled dreams in a mini-pyramid beneath the I.M. Pei-designed glass pyramid. You have until April 12 to submit your most creative answer to this question: “Why would you be the Mona Lisa’s perfect guest?” An experience of a lifetime awaits with the Rediscover the Louvre with Airbnb – bonne chance !